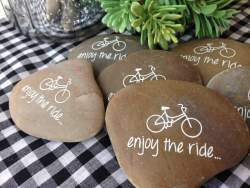 We are pleased to offer fully customized engraved river stones and personalized rocks in a range of colors and sizes. From pink mini-pocket stones to gray hefty paperweights, you can order exactly what you want to make the perfect gift, remembrance or milestone award. Your custom rocks are made from natural river stones and available in a polished or unpolished finish. Select from colors including earth tones, white, black, cream, gray, green and pink, and personalize with words and images in your choice of font and fill color (we can do combinations of words and images, such as a motto with a graphic logo). It's easy to place your order for personalized engraved river stones and rocks. Purchasing in bulk means you can share as many as needed, and at a great price. The more you buy, the more you save. Just let us know what you require—the sky is the limit!